When I agreed to host an impromptu backyard barbecue last month, the easiest part of the menu to decide was dessert. I had just received fresh rhubarb in my Full Circle delivery, as well as a bunch from my mom (who had gotten it from her neighbor). My friend Dana, who was attending the dinner, voted for cobbler. Two other guests, Andrew and Lorie (who took photographs that evening—many of which have appeared on the blog), walked to the local store to pick up the ice cream, because who can have cobbler without ice cream? The cobbler looked beautiful in the blue ceramic plate that my friend Courtney gave me (see photos below), and it was a hit with my guests—though I did manage to save one small piece for my husband, who was on a fly-fishing trip that weekend. To prepare filling: Stir sugar, cornstarch, cinnamon, and salt together in large bowl. 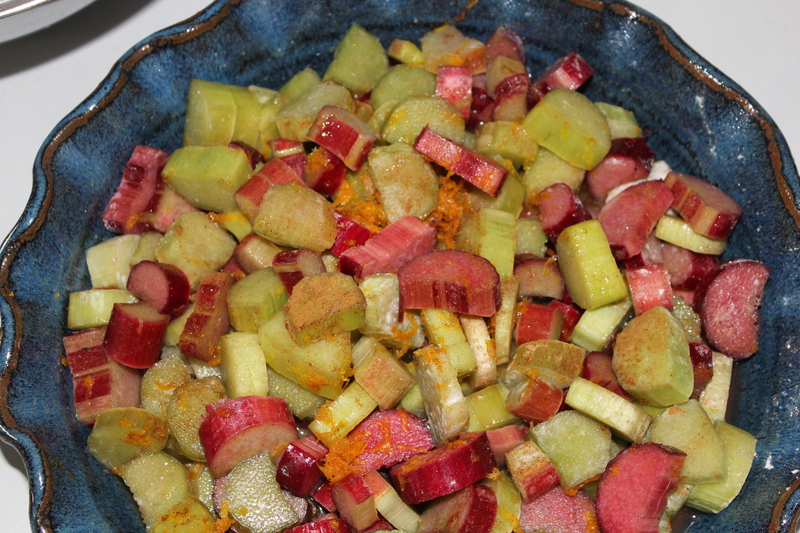 Add rhubarb and mix gently until evenly coated. Add orange zest and juice, and mix to combine. Transfer mixture to a 9-inch glass pie plate—or a ceramic one, as shown at right. 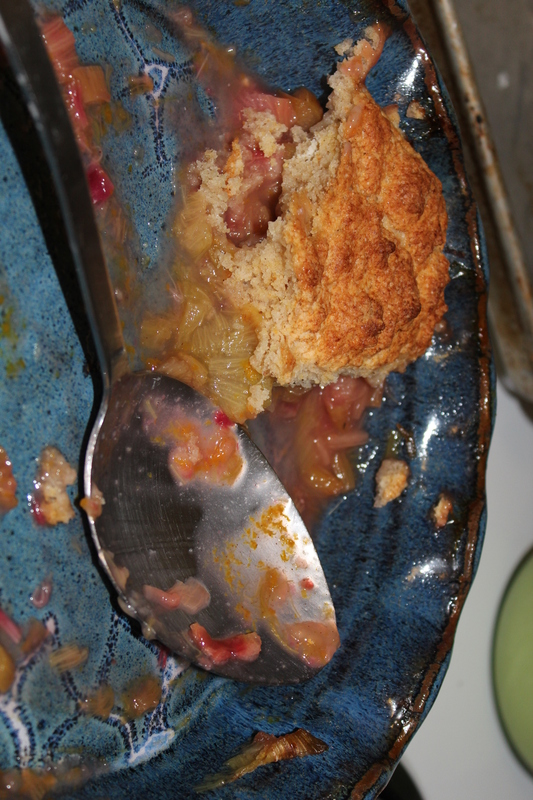 Place pie plate on rimmed baking sheet and bake until filling is hot and bubbling around the edges (about 25 minutes). To make topping: Whisk flour, cornmeal, ¼ cup sugar, baking powder, baking soda, and salt in a large bowl to combine. Whisk melted butter, buttermilk, and vanilla together in a small bowl. Mix the remaining 2 teaspoons sugar with the cinnamon in a second small bowl and set aside. 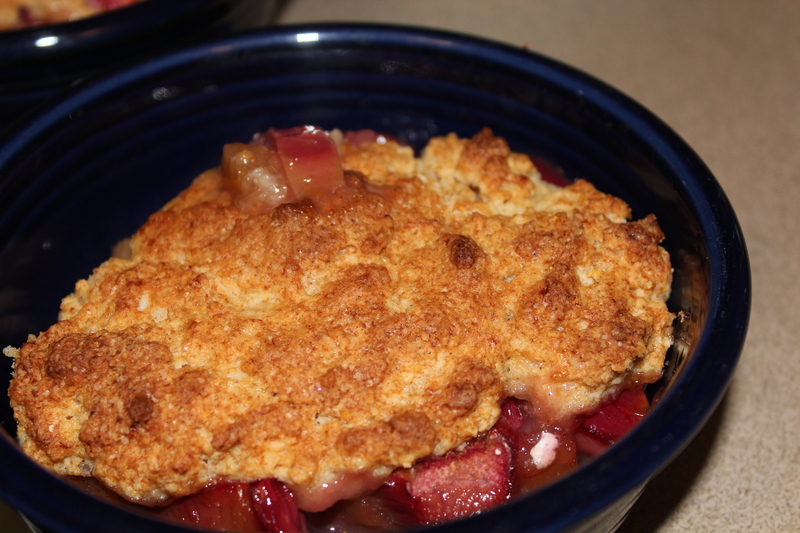 One minute before rhubarb comes out of oven, add wet ingredients to the dry ingredients and sitr until just combined and no dry pockets remain. 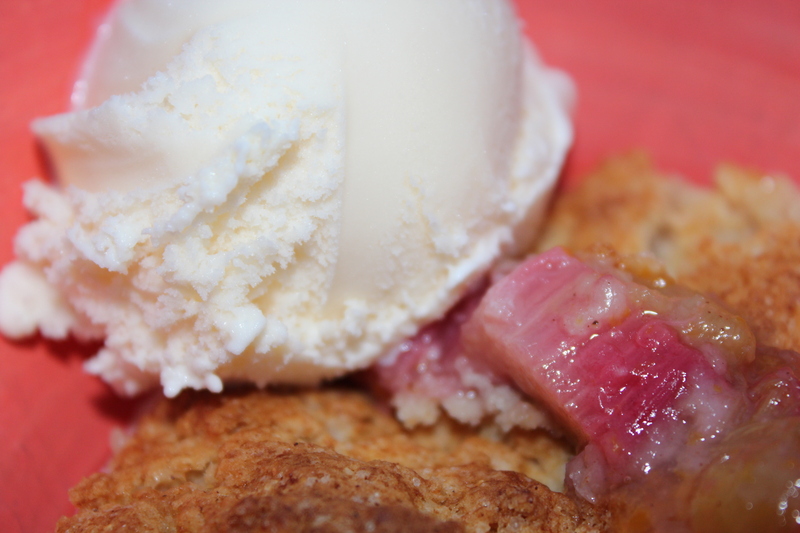 To assemble: Remove rhubarb from oven, and increase oven temperature to 425° F. Pinch off eight equal pieces of dough and place them on the hot fruit filling, spacing them at least ½ inch apart (they should not touch). Sprinkle each mound of dough with cinnamon sugar. Bake until filling is bubbling and biscuits are golden brown on top and cooked through (15-18 minutes). Cool cobbler on a wire rack for about 20 minutes and serve. Cobbler recipe adapted from Baking Illustrated (America’s Test Kitchen, Brookline, MA; 2004). This entry was posted in Desserts, Fruit, Recipes and tagged Baking, rhubarb. Bookmark the permalink.